Although Rhennthyl is the son of a leading wool merchant in L'Excelsis, the capital of Solidar, the most powerful nation on Terahnar, he has spent years becoming a journeyman artist and is skilled and diligent enough to be considered for the status of master artisan - in another two years. Then, in a single moment, his entire life is transformed when his master patron is killed in a flash fire, and Rhenn discovers he is an imager - one of the few in the entire world of Terahnar who can visualize things and make them real. He must leave his family and join the Collegium of Imagisle. Imagers live separately from the rest of society because of their abilities (they can do accidental magic even while asleep), and because they are both feared and vulnerable. In this new life, Rhenn discovers that all too many of the 'truths' he knew were nothing of the sort. Every day brings a new threat to his life. He makes a powerful enemy while righting a wrong, and begins to learn to do magic in secret. "Imager" is the innovative and enchanting opening of an involving new fantasy story. ""Meticulous worldbuilding . . . . The world is fascinating, and the Imagers themselves are extraordinary." ""Modesitt has drawn a world intriguing enough by itself and thoroughly integrated the magic of imaging into it. The characters are real people, learning and struggling and dealing with their families. Rivetingly beginning a new series, the Imager Portfolio, this is thoroughly absorbing, whetting the appetite for the next installment." ""The prolific Modesitt kicks off a new fantasy series that boasts an early modern setting--think Victorian times without the pollution. . . . Modesitt's capacity to wring new surprises from stock ideas remains undiminished." ""Excelling in his characterizations and the verisimilitude of his world building, the author of the long-standing "Recluce" novels and the "Spellsong Cycle" crafts an intriguing series opener about the magic of creation and perception." ""Readers will look to future installments for the derring-do promised by Rhenn's martial studies and frequent mentions of stormy international politics." ""The prolific Modesitt kicks off a new fantasy series that boasts an early modern setting-think Victorian times without the pollution. . . . Modesitt's capacity to wring new surprises from stock ideas remains undiminished." "The author's skill in portraying the humanity of characters who possess the power to destroy others with a thought adds a level of verisimilitude and immediacy rarely found in grand-scale fantasy." 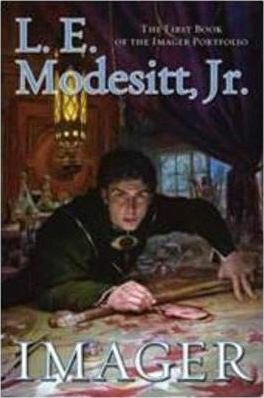 ""Modesitt is an extremely intelligent writer, possessing remarkable ingenuity at creating systems of magic and a real gift for characterization." ""Modesitt's work shines with engrossing characters, terrific plotting, and realistic world-building." L. E. MODESITT, JR. is the bestselling author of more than seventy novels encompassing two science fiction series, the Ghost Books and the Ecolitan Matter, and four fantasy series, the Imager Portfolio, the Saga of Recluce, the Spellsong Cycle and the Corean Chronicles. He lives in Cedar City, Utah.